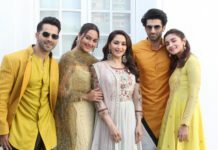 5 Inspirations For The Modern Day Bride - Wedding Affair var admin_url = "https://weddingaffair.co.in/wp-admin/"
Indian designers are known for creating an exquisite range of bridal clothing. When we talk about bridal clothing few names instantly pop into our minds.. Sabyasachi, Manish Malhotra, and Ritu Kumar. While most of their bridal designs come into the public eye when they’re worn by celebrities. However, we have a few bridal designs by them and other high profile designers that should make headlines. Almost every bride to wants to be styled by him. Words fall less when one tries to explain the kind of work he puts together. While most of our favourite brides Priyanka, Deepika and Anushka sported Sabyasachi designs the following are the ones we loved from his bridal collection! 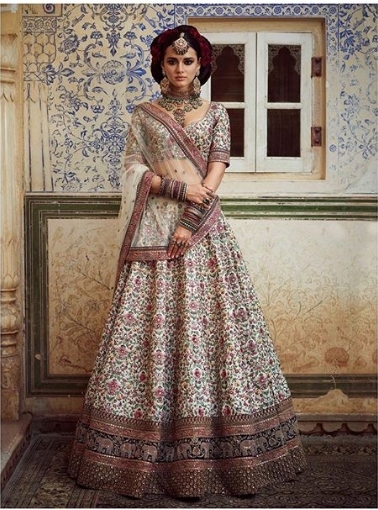 This beautiful white lehenga is embroidered with silk floss, semi-precious stones and pearls with zardosi border. 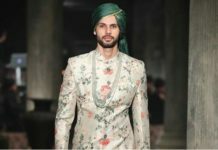 It is inspired by Mughal miniatures and is surely a sight to behold. One can only imagine the effort and skill required to put forth such a magnificent piece. Manish Malhotra’s designs are no less than magic. What he creates is a blend of authenticity, contemporary and traditionalism. This design by Manish Malhotra leaves us spellbound. We love the colour, the intricacy with which the garment has been curated. We’re loving the unique colour combination. Usually, we see bridal outfits designed with a specific colour. Here the outfit is a combination of green and orange. 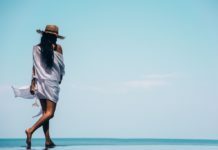 The outfit seems like one that can easily be carried. It is not heavy and elaborate but its presence cannot be denied. The colour will immediately catch your eye, especially the dupatta with the gorgeous golden work it is adding glamour to the attire. This image reminds us of the word “dreamer”. The extensive and colourful embellishments on the lehenga are to die for. 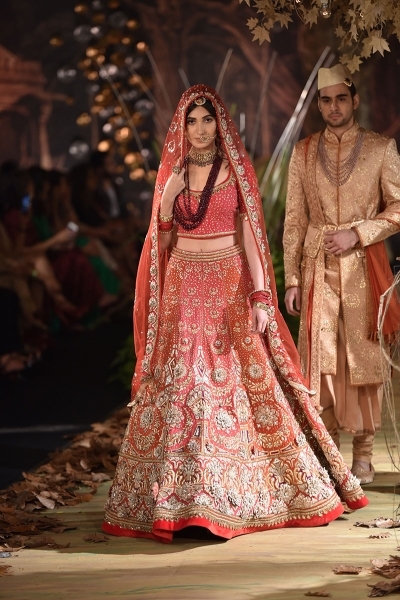 This is not the mainstream bridal lehenga. The way in which colour has been infused is what one calls “art”. 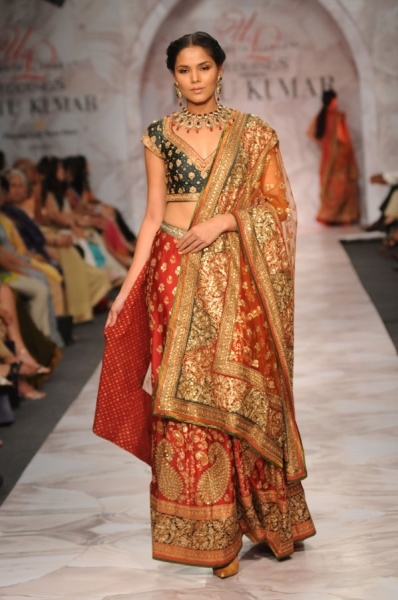 The full sleeved blouse with the same pattern as is on the latter half of the lehenga makes is extremely desirable. 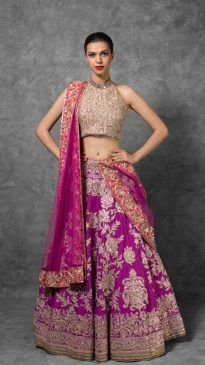 This bridal outfit has an old charm to it, with a subtle colour combination and minimal makeup the bride would look as ravishing as the model wearing the piece for display. We love how the jewellery is not overshadowing the garment in any way. To pair subtle colour with heavy bright jewellery takes away the limelight from the garment. However, if you’re a fan of heavy jewellery this outfit would also serve the purpose as the jewellery would be beautifully highlighted on such a colour. Also Read: Sonam Kapoor’s Guide To Rock Junk Jewellery!